If you have to go into the Bronx for a series late in the season, this is the way to do it. 8 Games up on the Yankees, they've just lost 3 of 4 to the Tigers ending in Mike Mussina getting lit up and pulled after 3 innings of work. The Yankee bullpen didn't fare much better and Justin Verlander posted a shutout on the usually explosive Yankee offense. The Yankees limp into the Bronx still in wild card contention thanks to Seattle's 3 game losing streak. The Rocket choked in the opener of the series giving up 6 runs over 5 innings, the bullpen had to cover the remaining 5 2/3 before the lead was blown in the 11th. 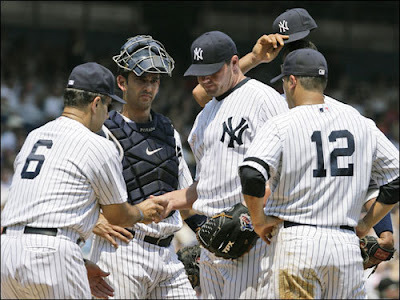 Tonight the Yankee bullpen had to eat the remaining 5 innings Mussina left them. The Red Sox had an off day today and walk into Yankee stadium with the best record in baseball and coming off of one of the biggest routs in baseball history as they destroyed the White Sox in Chicago to sweep a four game series and outscored them 46-7. The sox are red hot and the Yankees are ice cold, seems like the perfect conditions to finally KO the Yankees' AL East ambitions. Fortunately for the Chicago fans, at this point in the year they've already dropped the White Sox in favor of the cubs and didn't have to witness the incredible beating they took at the hands of the Red Sox in this four game series. The consistently inconsistent Sox offense seemed to finally be clicking all throughout this series as they lit up the White Sox pitching staff for 46 Runs over 4 games. FORTY-SIX! In the meantime the Yankees struggled with the Angels and the Tigers and the AL East lead is back to a robust 7.5 Games. I can't think of a better way to roll into the Bronx with a chance to put the Yankees out of the AL East race for good and possibly set them back in the Wild Card. The sox put up two quality games against the Rays as the Yankees dropped their first two to the Angels in dramatic fashion. Tim Wakefield continued to confound the Devil Ray whippersnappers with his knuckleball and Kevin Cash filled in admirably for the injured Doug Mirabelli. It's nice to see that the sox have found somebody in the organization besides Mirabelli who can catch the knuckleball without a dozen passed balls per game. Seeing the sox getting to Scott Kazmir early and often was also a nice touch as he typically pitches so well against the Red Sox. There really isn't much to complain about from the first game, they did everything well on both sides of the ball and cruised to an expected victory. The second game the Red Sox again put up another strong performance offensively, but raised some concerns about Jon Lester. What really killed me about Lester's performance was the walks and homeruns. He gave up 4 walks over 5 1/3, one was of no consequence, two would be brought home by a subsequent home run and the last would buy him an early ticket out of this game. If he's giving up walks and then giving up homeruns when the pressure is on it could be bad news against an offensive powerhouse like the Yankees. Manny Delcarmen is still struggling to regain his form from earlier this season and seemed to be having some control issues when he hit a batter and walked a batter to bring Okajima into the game. Declarmen hasn't had any Gagne level screw ups, but hasn't looked all that sharp lately either. Papelbon looked really dominant in the last four outs of the game striking out the first three batters he faced and getting the last out on a popup. I think alot of people were expecting a second half drop off by Papelbon like they had seen in previous years, but Paps looks as though he hasn't lost a beat. In August he's had 8 appearances, allowed one hit, walked 3 and struck out 14 batters. Tonight Dice-K goes for the sweep. The Rays have won two games against the Sox all year, both were in Dice-K's last two starts against the DRays. His first loss was a tough luck loss leaving a tight 1-0 game in the 7th inning before Manny Delcarmen gave up back to back homers to give the Rays a substantial lead. In his last start he fell apart in the third inning against the Rays and left the game after six innings with a 6-0 defecit. Hopefully Dice-K can turn it around tonight with a win. The sox split four games with the Angels at Fenway park and there's quite a bit to talk about. Clay Bucholz made his first major league start and got his first major league win. Eric Gagne managed to throw away another game for the Red Sox. The Sox bats seemed to wake up for the first 3 games of this series and then posted one measly run in the finale. Clay Bucholz has been a highly touted prospect all season long and got his first taste of the big leagues in the day game of the day/night double header on Friday. He pitched reasonably well all things considered. He pitched against the offensively powerful Angels, but he caught them at an excellent time as they flew in from Toronto the night before and had to play a double header the following day. So I would guess that that evens out. The sox bats took the Pressure off Bucholz early by posting six runs on John Lackey in the first. Bucholz had some trouble with giving up leadoff walks/hits, was helped on multiple occasions by double plays, seemed to struggle with control at times, only pitched six innings and gave up four runs to keep the Angels in the game; but all in all I still felt this wasn't a bad showing for his first outing in the Majors. He'll likely benefit from some more time in Pawtucket and could be a strong contributor for the sox in the future. Eric Gagne managed to do it again. The entire town of Boston seems to have collectively lost it's patience with the struggling reliever who once again gave up the lead and probably the win. The only people that haven't lost their patience seems to be the Red Sox themselves as Gagne was put in the game with a 3-1 defecit in the final game of the Angels series where he again allowed multiple runners on base before closing out the inning. I would just love to have something to cling to so I could defend Gagne. One situation where he comes out, throws a clean inning and heads back to the dugout. Since he's been in a Sox uniform he just has not been able to deliver on this for us and it's starting to concern me. Curt Schilling had a rough outing in his start. Fortunately, the sox bats provided him with 10 runs to smooth out the rough edges and this less impressive start by Schilling got swept under the rug as he took home the win. Since his return from the DL Curt has put up a 4.50 ERA, not terrible, but not that great either. Julian Tavarez put up a solid 6 IP 2H 2 ER in the finale which would unfortunately go to waste as the sox bats were unable to produce the runs to capitalize. Kevin Youkilis' slump continues going 2 for 14 in the series with 6 strikeouts and 1 walk. This upcoming series in Tampa will hopefully settle the Red Sox down. The road trip continues to a 4 game series with another division cellar dweller in the White Sox, then an off day and then a three game series in the Bronx. The Yankees will take 3 games against the Angels on the West Coast, an off day, and then 4 games against Detroit in Detroit before meeting the Sox in the bronx. This is an excellent opportunity for the Red Sox to make up for some lost ground by playing the AL's worst while the Yankees play the AL's best. DiceK gives up so many runs even the Rays bullpen can't blow it! It's amazing how playing against a team like the Devil Rays changes your perception of what's good. Anything short of a sweep against the Rays feels like a failure. The sox managed to eventually score some runs off the starter Sonnanstine and almost won another game off of the weakness of Tampa Bay's bullpen. Fortunately, the Yankees dropped their series to the Orioles after hitting a 3 run home run in the 9th to put the game into extra innings. This two game losing streak may be indicative that the Yankees are cooling off once again. Both Yankee losses must be disheartening given the 12-0 pounding they took in the second game and then losing after a dramatic ninth inning comeback and hopefully this will carry over into their next few games. At this point I almost feel like a Yankee loss is better than a Red Sox win as I'd prefer it if the Yankees didn't win the wild card. Facing and losing to the Yankees in the Post Season would feel like a colossal failure after dominating them in the standings all year long. Daisuke had a pretty terrible outing, his worst since early July. He's still adjusting and he's put up some solid numbers in his last few starts, so that's not what concerns me. The troubling part about this game was that he got beat up by the Devil Rays. Daisuke only had one clean inning and most of his others looked shaky right from the start. Julian Tavarez would take over and pitch a clean inning and got into a bit of trouble in his second inning of work before handing off to Mike Timlin. Mike Timlin wrapped up the eighth and threw a clean ninth and has looked extremely strong lately. Outside of Timlin's meltdown in Seattle back on August 3rd where he took the loss, he's been light's out in his recent appearances and could become a key contributor if Eric Gagne isn't as reliable as we had hoped. The sox did the same thing all three games of this series. The Tampa Bay starter gave a good start and was pulled after 6-7 innings despite their lights out performance and the bullpen would come into the game and efficiently give up whatever runs were necessary to ensure a loss. It had worked in the first two games of the series, why not the third? Unfortunately, Daisuke gave up one too many and the sox bats couldn't pull off the late inning heroics despite both Ortiz and Manny coming to bat in the ninth with the opportunity to win/tie the game. This is another episode in a disturbing trend where Big Papi and Manny both seem to have lost their ability to get the big hit when it really matters. Our late game heroics have been coming from the likes of Mike Lowell, Coco Crisp, Jason Varitek and even Julio Lugo this season. Kevin Youkilis has not looked like himself all series long going 1 for 13 with 6 strikeouts and no walks over the course of this series. All three stats are astounding given that he's been a consistent hitter all year who is good at drawing walks and rarely strikes out. Dustin Pedroia, JD Drew and David Ortiz also went hitless today although Ortiz was able to draw 2 walks. The sox really needed a nice easy series against the Rays to bounce back from the terrible showing against the Orioles over the weekend. Tonight Red Sox nation is resting just a little easier. Jon Lester had an extremely strong outing, which he desperately needed given the three shaky starts he posted prior to this game. Eric Gagne is still without a clean inning, but managed to hold onto a one run lead and hopefully built up some self confidence and gained some goodwill with the hometown faithful after a the weekend from hell in Baltimore. He even picked up the win for his inning of work. The Red Sox again showed that when absolutely necessary they do have what it takes to come back and win. 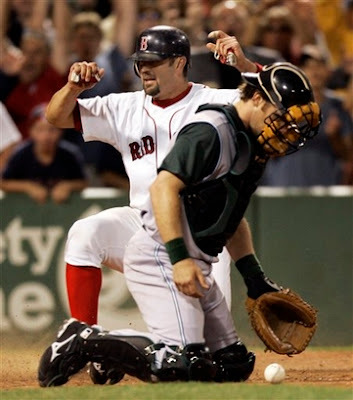 A solo homerun from Mike Lowell, a double that almost left the park from Jason Varitek and a single from the ill Coco Crisp was enough to win the series against the Rays. While this was going on the Yankees fell very flat against the O's in a 12-0 rout bouncing the Red Sox lead in the AL East back up to 5 games. Lester's only blemish on the day came in the form of a Carl Crawford leadoff double in the 4th followed by a single and a sacrifice fly. 5 of his 7 Innings were clean and minus an inconsequential leadoff walk in the first he retired the next 3 batters easily. He really made the Tampa Bay Devil Rays look like.......the Tampa Bay Devil Rays. Manny Delcarmen looked shaky allowing a leadoff single and a walk to put himself in a 2 on and no out situatuion in the 7th. Luckily MDC pitched his way to two outs, intentionally walked Carl Crawford before handing off to Mike Timlin who finished off the inning. Gagne would come in for the ninth and looked sharp striking out 3 of the 4 batters he faced. The two out double by Harris keeps Gagne from recording his first clean appearance by the sox, but he still managed to get the job done. I have alot of respect for the pitching abilities of Scott Kazmir, ever since his rookie season I've noticed him as one of the bright spots on a team without many bright spots. I often wonder if he would be a household name if he were on a team that could put up some runs for him. That said, the Red Sox still looked incredibly lame against Rays pitching for eight innings. One of the benefits of playing the Rays at this point in the season was manifest as they pulled Kazmir after 6 innings despite only giving up 4 hits and working on a shutout. With the Rays unable to make the post season this move makes perfect sense and again the sox reaped the benefits by scoring their runs off the Tampa Bay bullpen. It looked as though the sox would start turning the tide immediately in the 7th with a leadoff walk to start the inning, but a botched bunt attempt by coco crisp and double play ball by JD Drew would end the inning. The eighth was an uneventful 1-2-3. A borderline strike 3 call on Manny Ramirez for the first out of the ninth had me sweating bullets, but fortunately Mike Lowell delivered with a home run over the monster. Youk would strike out on another questionable strike 3 call before the magic began. With two outs Jason Varitek hit a shot deep to right, just a few feet shy of a home run. Coco followed up with a hit, the throw was off and Varitek was able to score from second without a play at the plate. I wonder how much Steinbrenner paid to get Gagne to throw every close game he entered? That's the only explanation I can come up with to explain his dismal performance ever since joining the sox. This is the second easily winnable game that Gagne has handed to the lowly Orioles and cost the Red Sox another game over the Yankees as the lead in the AL East fell to four. He's managed to waste two excellent starts by both Daisuke Matsuzaka and Curt Schilling. Pathetic, that's the only word I can think of to describe Eric Gagne's perfomance in the opener against the O's. 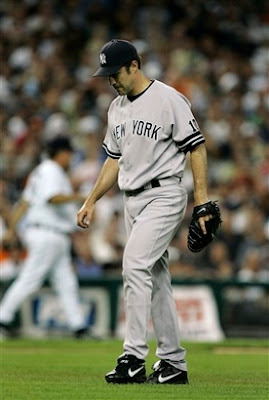 He has been shaky in his first few appearances for the sox, but this was the first time when he just flat out blew it. He gave up 3 runs in 1/3 of an inning before getting pulled for Okajima. Okajima also fell flat and would give up the tie and then the win the following inning. 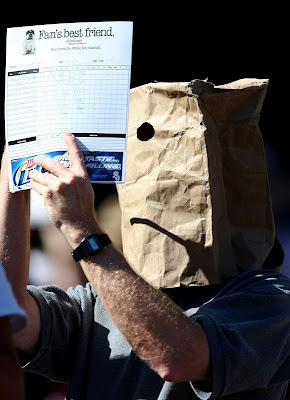 This is possibly the most disappointing loss of the year for the Sox. It should have been an easy win, but Eric Gagne couldn't hang onto a four run lead for more than a third of an inning. Okajima couldn't keep inherited runners from scoring or pitch a scoreless inning to allow the Orioles bullpen a chance to give the sox the game like they always have this year. I'll try to make a more well rounded post about this game later, but I'm too pissed off to think about it too much right now. It has been reported that the Celtics have encouraged Reggie Miller to leave his job as a TNT analyst, don the green and white and help the Celtics win a title. You're kidding right? The guy retired back in 2005. At age 42, for Reggie to get back in shape and be able to play at anywhere near his old form would require a herculean effort. 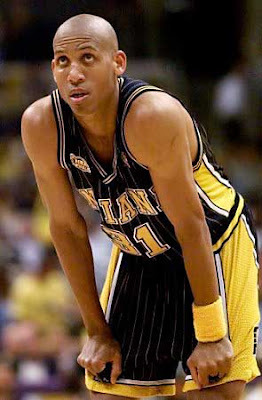 On a personal note, I hate Reggie Miller. Tommy Heinsohn always pointed to the "flops" from Miller who would flop back to the floor at the lightest touch in order to get the call from the referee. He got 3 emmy nominations and two thumbs up for his performance. I think Danny might be trying a bit too hard to silence the "You need 5 players not 3" naysayers like Bob Ryan. If this year's Eastern Conference proves anything it's that you don't need a well rounded team to make it to the finals. Lebron James carried the Cavaliers to the finals like lambs to the slaughter. If Lebron can drag a team full of nobodies to the finals then Paul Pierce, Ray Allen and KG should have a chance to win a championship with some nobodies in tow. This is Tim Wakefield's worst start in quite some time. The more I see of Wakefield the more I get the impression that he can't pitch to good teams. It seems like everytime he's put up against a team that can produce offensively his knuckleball is getting hit all over the park. Against younger, less experienced teams who haven't seen the knuckleball very much he's unhittable. Tim Wakefield had one good inning, the third. He went 1-2-3 in that inning, but would look shaky in the first, second and fourth innings and would have to be pulled early in the 5th when his game completely fell apart. Wakefield gave up the lead and handed Manny Delcarmen the baseball with inherited runners and no outs in the inning. Delcarmen didn't do him any favors by allowing both inherited runners to score in his inning of work before finally bringing this inning to a close. Julian Tavarez's one inning of work also looked terrible with coco crisp making an error and another two runs to score. This is about where I decided to go watch something else. From what I can see this is where Tavarez induced a double play to end the inning. Kyle Snyder put up the only respectable pitching performance for the sox by eating two innings. He posted a 1-2-3 inning in the 7th, quickly got two outs in the eighth, allowed a solo homerun and then got himself into and out of trouble to end the inning. Even if the sox had a better day at the plate I don't think it would have made too much of a difference given that the pitching staff gave up 10 runs. There were some missed opportunities. Sending Mike Lowell home with no outs in the inning seems like a terrible idea in hindsight and probably cost the Red Sox two runs. Mike could have scored on the ground out by JD Drew that followed and coco could advance and then score on the ground out by Doug Mirabelli that followed. Instead, the sox got nothing out of this inning. Although it did yield a run, I felt that the two men on with no outs situation in the first was squandered with both Ortiz and Manny sacrificing. The Red Sox posted 4 1-2-3 innings and that's just not going to win games. This drops the AL East lead down to just 5 games as the Yankees have won 5 straight and 8 of their last 10. If the Yankees don't cool off soon we might have a race on our hands. Fortunately, the Yankees get Halladay in Toronto tonight and then 3 games in Cleveland. The Red Sox finish the last of their west coast games tonight, head to Baltimore for 3 games and then come back to Fenway for 3 games against the Devil Rays. There were four game changing calls in this game, one was correct, one was borderline, one was probably incorrect and one was definitely incorrect. Every one of them went against the Red Sox. The correct call was Brandon Moss bobbling a routine fly to right before making the catch, the runner had the right to go as soon as the outfielder made contact with the ball, even with a clean catch Moss had no chance of causing a play at the plate and the fourth run for the Angels scored. 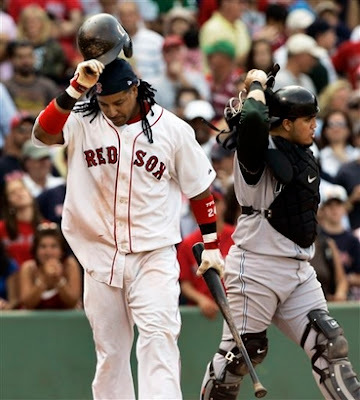 The borderline call was concerning Manny Ramirez's check swing. The home plate umpire called strike insisting that Manny was not able to check his swing and then refused a second opinion at Manny's request. Looking at the replay this call could have gone either way and a second opinion would have been appreciated, Manny was upset about the call and made the stupid move to argue balls and strikes with the umpire and got himself ejected from the game. With Eric Hinske on bereavement leave the replacement was a rookie from Pawtucket named Brandon Moss who obviously didn't expect to play in this game and looked to be scared shitless to be playing in the majors. The game would end on a strikeout of Moss with two men on base, I can't say things would have turned out much differently if Manny Ramirez had been at the plate, but I would have liked our chances. The "probably wrong" call refers to the foul ball that on replay seemed to land just to the left of the third base line and no chalk dust was kicked up by the impact, suggesting it did not hit the line and was a foul ball. This was called a fair ball and would turn into a double and would close out the night for Curt Schilling trailing 3-2 in the 7th with no outs and a man on second. Two sacrifices would be adequate to advance the runner against Tavarez and pad the lead making it 4-2 and close the book on Schilling. The" absolutely wrong" call came in the top of the eighth. Mike Lowell was up to bat with two men on base and no outs, a rally seemed imminent. Mike Lowell hit a foul tip and the home plate umpire ruled this to have been caught by the catcher and called a strikeout. The third base umpire would confirm this call. On replay there is no doubt that the ball hit the ground before bouncing into the catcher's mitt. The would be rally did not yield any runs. I was very upset by the quality of the umpiring in this game and think it very well could have cost the Red Sox the game. I really thought Schilling pitched well all things considered. He looked very strong up until the fourth when he seemed to jam his index finger trying to knock down a bouncing ball from Vlad Guerrero with his bare hand. He got into some trouble that inning giving up a double to Matthews and then giving up the big hit to Kotchman to score two runs and tie the game. He resumed his earlier form after that retiring the next two batters and then cruising for the next two innings. He got into trouble again in the 7th by allowing a solo HR to start the inning and then allowing the double to Mathis that didn't look quite so much like a double as it did a foul ball. Tavarez did his best with the situation as the angels put up two consecutive sacrifices to score Mathis. He would then give up a double, intentionally walk Vlad Guerrero and struck out Anderson to end the inning. Mike Timlin followed up with a 1-2-3 eighth inning, not bad for an old man just off the DL. As you can see, there was plenty of dead weight in the sox lineup tonight. A 3 for 4 performance from JD Drew was wasted yielding no runs or RBI's on the night. Thanks to a walk to Pedroia from Weaver, Kevin Youkilis was able to post the only two runs of this game on a Homer. The good scoring opportunities were few and they were only able to capitalize on one. With four lineup spots going 0 for 4 on the night (Moss went 0 for 2 filling in for Manny) it's not surprising that the sox had trouble putting up runs. Having broken their Safeco winless streak the night prior, the sox chose to bask in the glory of having that monkey off their collective backs by beating up Seattle in the finale of their season series. For the second game in a row the Red Sox starting pitcher had excellent numbers that didn't really reflect how close the pitcher came to giving up a big inning. In the 1st, 3rd, 4th and 6th innings Beckett ended the inning with two stranded baserunners and the 5th was his only 1-2-3 Inning. For all those baserunners Seattle was only able to convert for one run against Beckett in his 6 2/3 IP. Okajima's services were wasted on his 1/3 inning of relief, but after extending the lead to 7 runs in the top of the 8th bringing him back in for another inning of work just didn't make sense. Manny Delcarmen effectively ate an inning with a nice 1-2-3 8th. Kyle Snyder gave up Seattle's only other run, but with the 8 run lead he was working with he can be forgiven for not throwing for contact and the fielder's indifference that allowed Ichiro to steal second and later convert into a run off of Vidro's single. The way I see it, his ERA was the only thing on the line at that point. It is so hard to complain about sox hitting given that the sox put up 9 runs this game, but here goes. They certainly passed up multiple chances to blow this game wide open earlier. The first and last runs of the game were assisted by Mariner errors. Despite scoring two runs in the 1st inning they still left the bases loaded. They loaded the bases again the next inning, this time with one out before Manny Ramirez hit into an inning ending double play and scoring no runs. They would score 3 runs in the 8th, but would again leave the bases loaded. Although the game was basically over at this point, they also left two baserunners on in the 9th. You get the idea. The bottom line was that they pulled it together in the later innings and managed to score more than enough runs to secure this game. A-Rod hits 500 career HR's and Barry tied Hank Aaron's HR record within hours of each other today. I really dislike A-Rod, I think he's competitive to the point where he's willing to bend the rules and throw sportsmanship out the window to win games. The "slapped ball" against the Red Sox and the yelling to throw off the Rangers 3rd basemen while fielding a fly ball immediately come to mind. 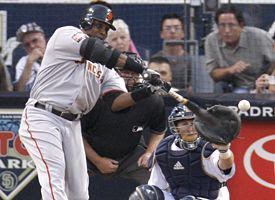 That said I think it pales in comparison to the Barry Bonds situation. Breaking this record is going to put a blemish on the record books that is going to be hard to ignore. I really hope that somebody who passionately hates Barry Bonds catches the record breaking ball, takes out a permanent marker and writes "Steroids", "Cheater" or "*" on the ball. I'd like to think that when future generations see that ball in Cooperstown they understand the disgust baseball fans had for what was happening to the game. For that reason, and that reason alone, am I happy to think that A-Rod will most likely pass him some time in the future and restore some dignity to the title of "Home Run King". The sox managed to snap their Safeco field losing streak in a shaky 4-3 victory over Seattle tonight. DiceK's stats don't really give the whole story (7 IP 2 ER 6 H 2 BB 10 K). DiceK got into trouble numerous times and was often assisted by double plays and some generous strike calls. It also didn't hurt that both of the runs he gave up came on solo home runs. In the bottom of the 3rd he managed to escape from a one out bases loaded jam completely unscathed. The very next inning he faced men at the corners with one out and was able to successfully induce the double play to get out of the inning. In the sixth inning he hit the first batter and walked the second but somehow managed to retire the next 3 batters to get out of the inning (2 by way of the K). Gagne came in to pitch the eighth inning and I had Deja Vu from Gagne's previous appearance at Fenway. Gagne entered the game with a lead, quickly retired the first two batters and then got into some trouble. Gagne gave up a single, then a double to cut the lead down to one, then ANOTHER double to put men at second and third with the red hot Betancourt coming up to bat. Fortunately for Gagne, Betancourt grounded right back to Gagne to end the inning with the sox lead intact. Paps seemed to be following Gagne's lead. He struck out both Vidro and Ichiro to start the inning and then got himself into trouble. With two outs and a one run lead he walked the next two batters as the Seattle faithful kept their fingers crossed for a bottom of the ninth rally. In incredibly anti-climactic fashion the following batter hit a pop fly into foul territory and Varitek made the game ending catch. I find it amazing that in a game where Red Sox pitching put up 13 K's they could still manage to look so shaky. The pitching staff on a whole gets a C-: Barely adequate performances all around, got the job done, but this game looked really sloppy and was often one hit away from a loss. The sox offense was reasonably well rounded with Coco Crisp and Dustin Pedroia being the only two in the lineup to go hitless. Youkilis, Ortiz and Lugo would all got two hits on the day. Jason Varitek's double to left would bring in Ortiz and Manny from second and first base to give the 2-1 lead in the fourth. Ortiz, Manny and Youk would also string together some hits in the 6th to add two more. The Sox offense gets a B-: They managed to set up Daisuke with a decent lead and the bullpen was just able to hang on. They looked pretty sad in Ryan Rowland-Smith 1 2/3 IP putting up only one hit and with Rowland-Smith striking out 4 of the 6 batters he faced. He's a rookie, constantly going back and forth between the minors and the big league this season, we touched him up for two runs in his only other inning of work against up back on June 25th. That said the plate umpire didn't seem to be hitter friendly with some questionable strike calls that drew some angry responses from both sides. Taking two out of three from the Mariners in their home ballpark to end the season series would be a nice sendoff as we may likely see them again in the playoffs. I don't know what I like better, watching the Red Sox win or watching the Yankees lose. It seems the Rocket is finally starting to show his age. Roger fell apart in the second inning against the White Sox giving up 8 runs. Watching him get booed off the mound in Yankee Stadium was especially nice. The Yankees would answer back to score 8 of their own in the bottom of the 2nd to end the day for White sox starter Garland. Luckily, former trade bait Jermaine Dye came up big today going 4 for 5 with two home runs to get the 13-9 win. The sox were again able to rely on the incompetence of the O's bullpen as Rob Bell came in for the 7th inning and gave the sox the four runs necessary to win the game. 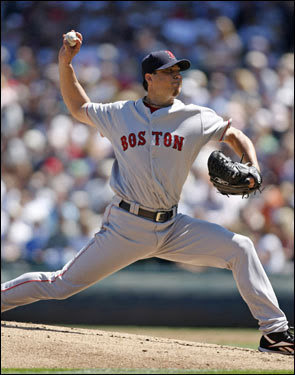 Tim Wakefield made a quality start (7 IP 3 ER 6 H 1 BB) before passing the 8th and 9th to Okajima and Gagne. Okajima did give up a hit but was able to induce a double play on the next batter to end the inning. Gagne took over the closer role for tonight. 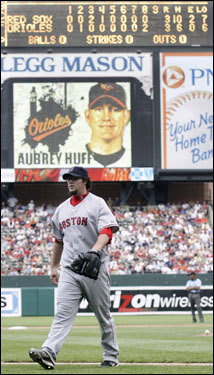 He looked very impressive starting off the inning with back to back strikeouts of Kevin Millar and Miguel Tejada, but then a double from Aubrey Huff and a single from Payton gave up a run before Gibbons flied out to end the game. At first thought, this performance was a bit concerning, but the lead he was working with may have caused Gagne to pitch for contact and quick outs. I think I'll wait for an actual meltdown before I start freaking out. The Red Sox start a 9 game road trip on the West Coast tomorrow with 3 games at Seattle, 3 games against the Angels and 3 games in Baltimore before coming back to Fenway for a series with AAA Tampa Bay on the 13th. The next 6 games are the roughest patch left in the sox schedule. Tomorrow's game is a late game, 10:05 PM start Horacio Ramirez (6-3 6.52 ERA) will match up against baseball's answer to Lance Armstrong Jon Lester. 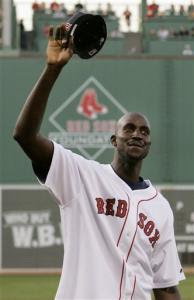 I was glad to see KG getting a warm welcome to Boston. This should make sure that even those sports fans who have established a mental block on any information regarding the Celtics are aware that there's a reason to head down to the Garden. I gotta admit, I was nervous there for a minute. Another loss at home to the O's would have really killed some of the great buzz generated by the recent acquisition of Eric Gagne. Luckily, the O's bullpen gift wrapped another win for the Red Sox. Shuey and Parrish managed to combine for four earned runs, two hits and two walks without recording an out between them. Chad Bradford's record is clean of runs, but all of his inherited runners scored before he could close out the inning. The Sox bullpen performed admirably picking up after a so-so start by Julian Tavarez in the absence of Kason Gabbard. Snyder filled in for 1 2/3 hitless innings, thankfully the two walks he allowed over that span didn't come back to haunt him. Javier Lopez successfully drew a ground ball out from Markakis to close out the inning. Hideki Okajima gave up his third home run of the season to Miguel Tejada, but was otherwise lights out. 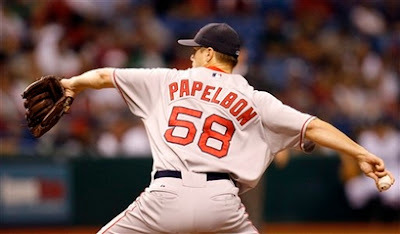 Johnathan Papelbon successfully bounced back from his blown save in his last appearance against Tampa Bay and looked truly dominant allowing no hits and striking out the last two batters. I felt that this win was important for the sox. They've established a reputation as a team that has a hard time coming back once they're down. David Ortiz isn't hitting a walkoff homerun every opportunity he gets anymore, but it was nice to see the sox break themselves out of a slump and score some needed runs in the late innings. Eric Gagne warmed up, but Paps lights out performance kept him from getting into this game. Given that Okajima and Papelbon worked tonight it's likely that we'll see him in the rubber game tomorrow night if the services of a closer are needed. Both the Gagne and KG deals are now official. I'd say my analysis of both of these trades hold true now that all the details have been hammered out.